Chart No. 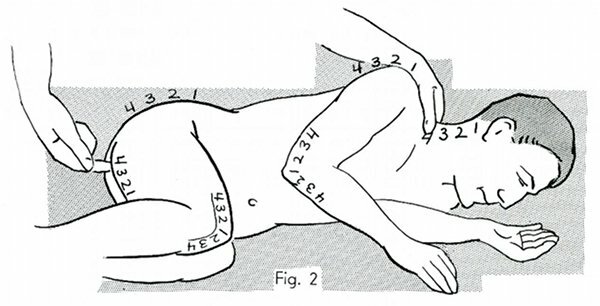 30 - Perineal Contacts in Relation to the Neck, Shoulder, Elbow and Hip. Deep and concealed energy blocks cause chronic diseases thru [through] spasms of tissue and stasis. For those conditions a steady and firm contact is used on the spastic muscles of the perineal floor. The applied line of force follows the blockade into the pelvis and holds it to toleration until it lets go. Used in all nervous and thyroid cases, for sleeplessness, neck and general tension especially in neurasthenia and respiratory symptoms. A left lateral atlas is usually an emotional block. Contact No. 1 releases the atlas on the opposite side. Perineal treatment correctly done will unlock energy blocks quicker than most other methods because it deals with the vital force of emotional locks and frustrations. For this purpose a light contact is used to relax gently and allow for release of surface energy blocks by sighing, crying, heavy breathing. Etc. Treatment should be repeated several times until the spastic sore spot vanishes. Correlate it with the other external areas given here. All reflexes come from below. Impulses of energy come from the brain. All energy flows in circuits or waves. Organic function demands energy. If blocked anywhere pain is the result. The contact is light at first; the direction is headward and toward the median line. The first finger is used to find the tense fibres [fibers]. The second [middle] finger is used for treatment. Fig. 1 shows a contact on perineal No. 1 under the symphysis pubis [pubic symphysis] and slightly to the posterior towards the ischium. The thumb of the left hand is on area No. 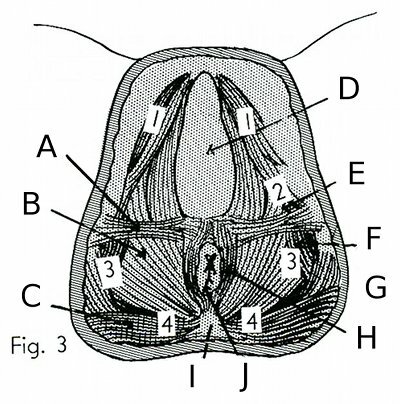 1 over the atlas and above it on the occipital and temporal bones behind the ear with first finger on the opposite side of the neck on the same area. Contact No. 1 relates to all No. 1 areas on the chart. Fig. 2 shows contact 4 further back on the perineum near the coccyx in area 4 and above on the cervical vertebrae 6 and 7 [six, seven, C6, C7] in the spinal groove. Both contacts are on the right side here. However, the current from the perineum crosses over via the central current and releases tension on the opposite side of the neck. Fig. 3 gives the location of the perineal areas and the musculature underlying the skin. Chart for perineal treatment described on pages 50, 51, 52 in "The New Energy Concept of the Healing Art." Page 49 gives a diagram of perineal floor and contact points. 1 In The Complete Collected Works, pages 87-89 and Chart 8, page 81 of Book 1.